The best hunting Day Packs play a vital role in making your hunt experience successful. In fact, it will determine how comfortable you are while hunting. Because it provides you well-designed and big capacity to keep and carry you’re all hunting gears safely. Storage Capacity: 24.2Ltr / 1,475 cubic"
Hunting is not a simple task as most of us think, So it is not good to go on without well preparation. For hunting process, you must have tools which help you far from the home and the places where naturally comfort and security is absent. When someone is on outdoor hunting, it is hard to stay in the forest overnight, but a good quality comfortable Day Pack can help you to stay confident on outdoors. So, in order to keep your gears safe and sound on the long trips, you need to have large hunting day packs that keep all of the essential hunting gears in it. As they are not too large in size, but large enough to hold them. We have compiled top ﻿8 ﻿excellent day packs after making the great effort in evaluating tests and searching their features. However, we are ﻿entirely ﻿confident that our effort will be helpful to you in selecting the item that fits your needs exactly. 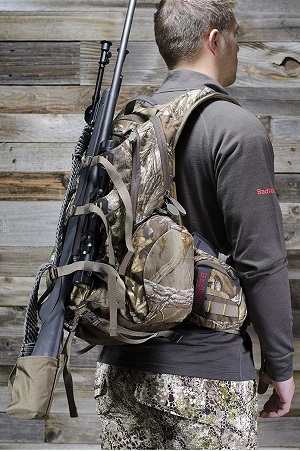 The hunting pack simply called “2200” is made by Badlands and is a tough, durable, and extremely popular hunting pack. This pack includes a zippered, back-panel access; a built-in Blaze Orange meat shelf; T-6 Aircraft Aluminum frame; a hip-belt pistol holster; and an integrated spotting scope pocket. With a reservoir capacity fit of 2 Liters and 7 pockets, this 2200 CI pack is versatile and tough for any outdoor task. It is carry compatible for bows, rifles, and pistols. The dimensions are 19” x 17” x 9” and the straps are comfortable and form fitting. The 2200 is the perfect day pack to off the best 8 hunting backpacks for hunters everywhere. It is one of the best-selling﻿ ﻿and ​Editor's Choice. 5.11 Outdoor offers you high-quality daypack to carry all essential hunting gears with you on the go. It is specially designed as a comprehensive bag, which keeps you comfortable, confident, and safely handles all your hunting gears on the way. RUSH 12 Backpack comes featured with 16 compartments, which are engineered for a wide range of storage options. What’s more, the worth mentioning feature to RUSH12 backpack is its internal admin panel, which enables you to organize small accessories. You may possibly organize a small 60-ounce hydration pocket, which helps you to stay hydrated even on the move. On the other hand, it also equipped with a fleece-lined sunglass pocket that is planted to protect your eyewear. 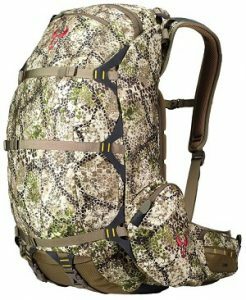 Another extensive wrap-around web platform provided by 5.11 Outdoor is MOLLE and 5.11 SlickStick System compatible. This utility lets you modify your storage that meets your all needs. Moreover, if you want to get an adjustable shoulder strap or external compression straps, then relax a bit, the RUSH backpack offers you all that in just a single pack. This product comes equipped with a centered sternum strap to make certain stability. More so, it offers water-resistant construction to retain your gear dry and secure in any weather. The Superday by Badlands, is one of the best Day Packs for hunting. It features molded form suspension for the best fit and comfort; a hip-belt pistol holster; easy access waist belt pockets; and five external compression straps, for additional gear and support. The Superday is intended as a Hunting Pack for day trips, rather than long term expeditions. It is excellent for hunting, camping, and forays into the deep woods. 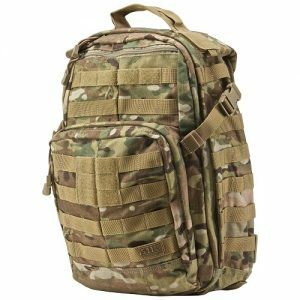 This pack fits a reservoir size of 2 liters; contains 6 pockets; has a total volume of 1950 CI; dimensions of 21” x 16” x 11”; and is carry compatible with bows, rifles, and pistols, as well as hunting/tactical/survival knives. It comes in 4 different camouflage patterns fit for nearly any environment. This is one of the best packs around and Badlands’ Superday exceeds all expectations in its capability of providing all of the necessary room, holsters, pockets, compression straps, gear pockets, and other support features. 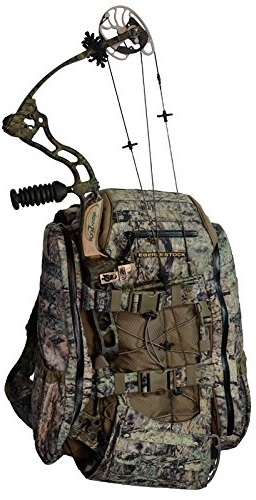 For the price, this is one of the most popular packs by Badlands and is favored by hunters. It is highly rated and is an overall great buy for the hunter, camper, trail hiker, and woods dweller who needs to pack up and head out for a long day. For hunters, it has capabilities of storing bigger loads from hunting game, and has all the room it needs for extra gear such as knives, rifles/pistols, flashlights, and other support. It can be your best companion when you are going outdoors for hunting. ​Condor is perfect for long-term hunts, where it is very important to carry essential gears secured. For a comfortable outdoor activity, this daypack is the best one, which experiences an ultra-comfortable trail. The Condor Outdoor’s offer you comprehensive handling of important gears for different outdoor activities. However, if you want to save your valuables and want to worth your money, then choose the Condor 3 Day Assault Pack, designed for long way hunting. 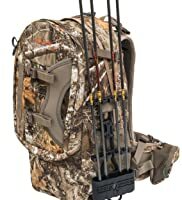 This hunting daypack comes with body contour shoulder straps with D-Ring for tackle attachment, sternum strap, and removable waist belt. In addition, it also comes featured with an individual foam pad back panel for extra comfort and maximum airflow. It means, this item is breathable & provides you durability, comfort to carry a large number of gears, with free hands. Eberlestock’s X-2 Hunting Pack is a real hunter’s pack that looks and acts the part. This compact, incredibly strong, and efficient pack is light and has a tubular-aluminum frame. Paired with its strong nylon and microfleece shell for strength and quietness, this pack is ready to go anywhere and quietly move with the one wearing it. 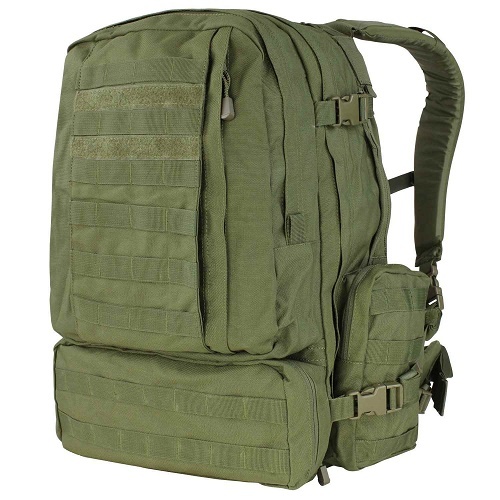 There are dual hydration compartments and large side pockets for any gear, such as flashlights, MRE’s, hunting or survival knives, and other gear. When it is said that the X-2 is strong, it is no hyperbole. During a test during the design phase, a 100 pound sand bag was attached to an X-2 using the built-in compression straps and it held up well. This indicates that you can use it to pack deer or elk quarters with ease and effectiveness. The X-2 is compatible with Eberlestock’s side scabbards, which are for shotguns and rifles, as well as its ARCG ButtBucket bow carrier. The waterproof fleece and 1,000 denier nylon material shell is light and supports the pack with reliability. Included is a long padded waistbelt for quietness and comfort as you hunt, hike, and camp. The FlexChasis can flip forward for use as a seat and it can cradle loads you carry. Padlock webbing tie points are placed in key locations for easy attaching of accessories and lasing on the gears. The special Shooter Harness makes firing a weapon and carrying heavy loads more comfortable and feasible. With a capacity of 1800 CI and a weight of 4.5 pounds, this Hunter’s Pack by Eberlestock is a must-have for any hunter—the price is worth the enhanced features the X-2 offers. ​In order to keep your gears in arranged manner whether hiking, traveling, and hunting or other outdoor activities, SOG Ninja Daypack appears as the best solution. This imported bag is made of 100% Polyester, comes with lots of compartments, each one has its specific use. The SOG Ninja Daypack also featured MOLLE webbing to attach other accessories as well as hydration pack access. A large main compartment measures 24.2-liters tactical backpack. What’s more, it organizes front accessories, a small accessory pocket for flat item storage. It also provides you a soft-lined pocket at the top for eyeglasses and other electronic devices. A hydration bladder pocket featuring a tubing port enables you to satisfy your thirst on the way easily. When you have to carry more gears, the SOG Ninja Daypack covered side compression straps, heavy-duty bottom-lashing loops. These included features are great for attaching wide range optional pouches, accessories, and modular tactical gears. 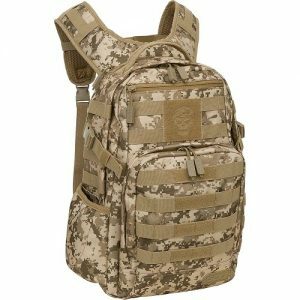 Furthermore, the military-style Ninja Daypack fits comfortably on your shoulders with its adjustable Yoke-style. It also featured padded shoulder straps, which featured an adjustable sternum slider for added security and comfort for your outdoors. Available in Black, Coyote, Desert Clay, Digital Camo, Olive Drab and Turbulent Blue designs. 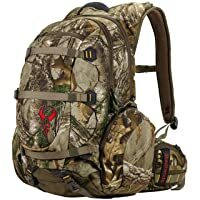 The highly recommended daypack by expert hunters is ALPS OutdoorZ Pursuit Hunting Back Pack, which provides a 2700 cubic inch capacity and is made of the aluminum frame. On-the-go hydration - It equipped with a hydration pocket, which is meant for keeping you hydrated throughout the day on outdoors. It also lets you use your most favorite water bladder for hands-free. 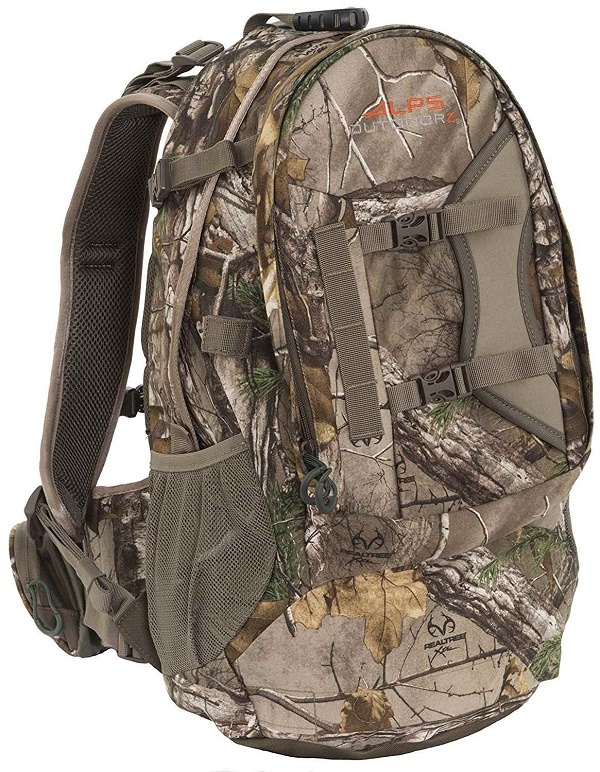 The perfect daypack by ALPS OutdoorZ provides you extension-lashing straps. These straps put the balanced weight of several gears and seem helpful in holding and carrying heavy contents conveniently. Similarly, the next segment “drop-down weapon holder designed to aid you hold your gun/bow. However, on the other hand, it also equipped with a padded shoulder harness, padded waist belt, and adjustable torso. These features provide you extra comfort and built-in to let you the full range of motion. An overabundance of pockets permits you to hold onto your favorite gear within spitting distance. 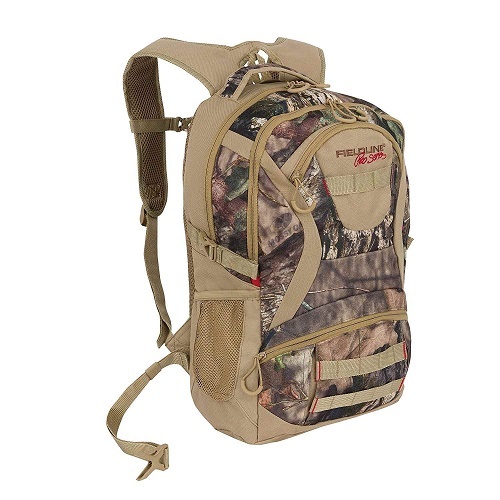 Simply, this useful daypack makes your hands free for climbing, glassing fields, mountaintops, and hunting prey. ​This Fieldline Men's has durable and most well-known daypack, which is specially designed for outdoor activities. If you want to pack up your must-have gears with the field line essential packs, then use Fieldline Men's. More so, the retailer establishment for a wide array of merchandise and is a primary source for outdoor gear. It also lets you hold hunting gears and other accessories everywhere. In fact, the daypacks are classified into 5 different types. Standard daypacks hold over 1500 to 2500 cubic inches, and weigh about 2 to 4 pounds. Mostly they are made of heavy-duty materials, and come equipped with many zippers and features. But, the only drawback is the thick padding as it causes irritation. This type German engineering daypacks use lightweight frame that are designed to keep your mesh panel rigid against wearers back. This utility enables good ventilation too. They are made of lightweight Nylon comprises size nearly about 1000 cubic/inches, with no padding. They weigh about 5 to 10 ounce, and are able to carry few pounds gear like light jacket, smart water bottle, shoot camera, and some hunting tools. You may also get the possibility to fold up Packable Daypacks into their own pockets. They are considered as more reliable and comfortable to carry even over couple of miles. Actually, Hydration packs are daypacks come with many features to make the hydration system friendly. It perfectly fits for the hydration system espacially on long trips and hot landscapes. In addition, this type daypack also provides you small holes to pass the drink tube to the outside. Mostly they are constructed of Nylon sleeve to hold the water bottle near your back. Technical Daypacks come with wide variety of weight and volume according to the sport. Often they are designed for climbing, racing, snow play, and hunting to carry essential stuff with you. If you have just starting out, then it might be difficult task to choose the best one backpack as comparing to the expert ones. So, in our content I tried to present the best suggestion for you that narrow down your effort little bit. Instead of investing your worth money for any junk item, read the buying tips given below. First, decide that for what purpose you are going to carry and invest. For that, figure out the conditions and duration of the trip, backpack style and weight (i.e. lightweight, ultra-weight, medium/heavy weight, hosteling/hut2hut style). This suggestion would be best guideline for beginners, but on the other hand, if you are experienced packers, I personally counsel to bring all your gears in a single pack. The size is most important aspect you have to think about, a large case encourages you to carry too much stuff with you. But, it will be more awkward and heavier if you pack unnecessary gears. On contrast, if you take too small package, then it will be fine with you. An internal frame pack comprises foam, plastic, carbon fiber, and metal. These materials mostly found inside the pack to give the pack structure and effectively transfer weight to the fashionable strip. One of the main benefits to internal frame packs is its ability to balance easily. They remain closer to your body and you are less likely to entrap things even when climbing. In addition, this frame is ideal for carrying greater amount of gears for outdoor activities. They are easily adjustable and have variable size. Materials play a vital role in the durability and performance of your daypacks. Usually there are four kinds of materials used for daypacks. Nylon is considered as more reliable and sturdy material, which is able to carry lots of weight. As well as, it also provides an ultraviolet protection and dries quickly, if wet. Rip-Stop Nylon is the one of the best variant of Nylon, which has ability to hold all of the characteristics of the Nylon. Yet the only difference that it is more resistant to wearing and tearing. In the past canvas was well-known material, while it can carry significant weights. Innovative group fabrics like polyesters are getting popular. They are amazingly lightweight yet hold a heavy load-carrying feature. It also offers UV ray protection. In my personal opinion, the Nylon, rip-stop nylon, and polyester type materials are best. Such materials offer you better UV protection. In fact, the daypacks come in two designs, a Camouflage design and a Solid colore design. Camouflage designs offer invisibility on the background of nature in the forest areas. On contrast, Solid design daypacks have also a good-looking color.